You guys have come up with many different suggestions, some pretty good ones but none of those have been just right. I would read them and think "new shoes, Ill just buy those!" or "A weekend getaway, who has time for that!" But then last night I was sitting at dinner and was talking about Crossfit. I was instantly excited just talking about it. I was talking about how much I wanted to try it and how I wanted to find a "real" Crossfit box and not just a Crossfit class. I have been wanting to do this for about a year now. So that's it. I found the box that I have looked up several times and got some more info! 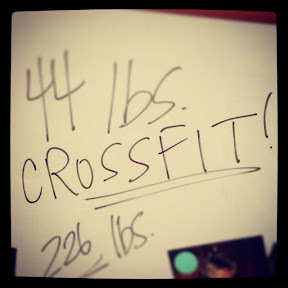 If I hit my Phase 2 weight loss goal I am gonna give myself a 3 month trial of Crossfit. It more expensive than I like to spend on my gym membership but its also a prize, and its cheaper than my bike! So now its official, I put it on my Extreme Weight Loss: Weightloss Edition Whiteboard and now I am already more motivated! That is awesome Emily. I have been wanting to try it too but thought it was so expensive. Which one are you going to? Hey Ragucci! I'm gonna try Crossfit Huntsville on Leeman Ferry.